Three Grace College business students were recently listed on the Global Top 100 ranking in the Business Strategy Game (BSG), a web based business simulation software that gives students a hands-on opportunity to learn how the global marketplace works. During the week of Monday, Dec. 9 through Sunday, Dec. 15 the business simulation of Bennett Putman, Lucas Denlinger, and Ryan Ramey was listed in the top 100 list of companies worldwide. Each week the best performing BSG companies (out of 1,126 teams worldwide) are measured on four performance variables: overall score, EPS (earnings per share), ROE (return on average equity), and stock price. The highest rated teams are highlighted on the BSG webpage. Putman, Denlinger, and Ramey’s business simulation had an overall score of 106.5, which tied for the 85th best overall score performance of the week from the 79 colleges and universities participating in the simulation. The team’s individual score in EPS was ranked 13th best worldwide and their stock price score was 9th best worldwide. The three students were taking part in the simulation for their senior seminar class taught by Alan Grossnickle, assistant professor of business administration at Grace. “I have taught this class approximately ten times between Saint Francis and Grace, and these are the highest scores I have ever seen,” said Grossnickle. In the photo (from left to right): Bennett Putman, Columbia City, Ind. ; Ryan Ramey, Van Wert, Ohio; and Lucas Denlinger, Warsaw, Ind. 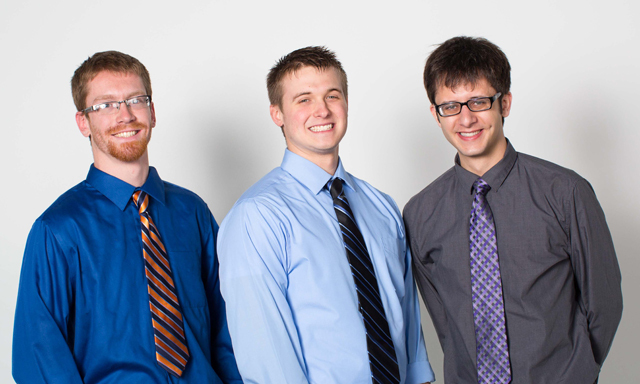 These three students comprised the Grace College team that scored among the top 100 participants worldwide in the Business Strategy Game simulation.